Leading Manufacturer of speciality label stock, void labels and destructive label stock from Navi Mumbai. Durofix Label Stocks are ideal for a number of applications due to our extensive experience over a span of 30 years in coated flexible substrates and our development proficiency. Durofix labels are used for a wide variety of unique or custom print and stick applications ranging from Destructive and Void Labels to laser printable films which are chemical resistant. We can provide top coated films for various print applications such as screen-printing, offset, inkjet, laser & thermal. Our labels also support new age digital print platforms such as Indigo, Nexpress, Xerox, Canon etc. The adhesive we coat can be adjusted as per the application ranging from- aggressive, high tack solvent acrylic adhesive which say would compliment the strength of polyester to removable and repositionable adhesive for specialty paper labels. We also have a unique range of Tear and Water resistant paper labels which provide the strength and durability of synthetic films with the ease of use and cost effectiveness of paper. Brite Coatings being able to undertake various topcoats and acrylic adhesive coating (Solvent & Water based) aims to provide a one-stop solution for all your unique Self-Adhesive Label applications. Various grades of adhesive can be used from high tack to removable and repositionable. Custom labels can be designed based on the requirement. Using a combination of face stock substrates ranging from PP, PVC, Polyester to paper and various top coats for inkjet, laser, offset printing. We can also provide features such as barrier coatings, food grade certification, scratch & heat resistance etc. By allowing our customers to pick and choose, hence providing the right media for their application. Manufactured in our ISO 9001 Quality Management System certified facilities. Durofix Void Labels are specialty security labels that offer a variety of asset and property labels with security features that help prevent unauthorized access and the altering, removal of such labels. 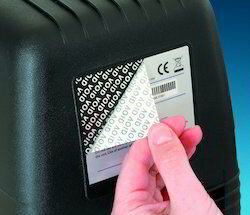 Common uses for security labels include Oil drums, electronics and other product warranty labels, brand protection on valuable products, and much more. Durofix Void Labels leave behind a repetitive “VOID” message on both the label and the item to which it was applied if any attempt is made to remove the label. To these labels we can add special deterrents such as a invisible ink that is only readable with a black light or security slits on the face of the label so it will quickly tear if anyone tries to remove it. Adding multiple layers of security can be regularly and affordably done to keep physical assets and data-sensitive information protected. 1) Replace void print on the label with a custom logo or branding. 2) Magnetic ink, readable with a special hardware, which can differentiate between an original DUROFIX label and a counterfeit. 3) Pre punched labels, sheeted labels with a thicker release liner to provide lay flat properties. 4) VOID print can be provided with customer specified colours. 5) On removal the face stock will develop an embossed orange peel effect so that it cannot be reapplied. 6) Available in tape form. We are involved in manufacturing and supplying a broad assortment of Destructive Labels. The offered labels are manufactured using supreme quality raw materials with the aid of latest techniques by our experienced professionals. These labels are commonly used on equipment, electronic parts, instruments and components to prevent against counterfeit. Furthermore, our valued clients can avail these Destructive Labels in multiple colours at economical prices. Durofix Destructive Labels is used for anti-counterfeiting, brand protection and tamper-evident seals. Destructible labels are used for authentication, theft reduction and protection against counterfeit on equipment, instruments, electronic parts and components in industrial and manufacturing sectors. Durofix Destructive labels are made out of ultra-destructible material, with very strong adhesive. These destructive labels, upon an attempt to remove, will fracture and rupture into small destructive bits, leaving behind evidence that material was tampered with. These destructive labels can be provided with bar-codes and serial numbers for added security. 1) Our destructive labels come with encrypted QR codes, bar codes and serial numbering along with customized logos. 2) Pre-punched labels, sheeted labels with thicker release liners to give lay flat properties. 3) High tack range is suitable for low energy surfaces. 4) Available in tape form. Looking for Label Stock ?